October is Breast Cancer Awareness Month, a worldwide annual campaign where thousands of organisations highlight the importance of breast cancer awareness, education and research. Multiple brands participate, usually using the famous pink colour to remind their customers of the great cause. Below are some of our favourite CSR campaigns from this year. Every year, the famous fashion icon uses the power of influencers and celebrities to help raise awareness. Alicia Keys was at the forefront of the campaign in 2017 and this year’s ambassador is Modern Family star Sofia Vergara. A clever choice from the brand as Latin women are said to have one of the lowest rates of breast cancer screening, with limited access to formal health care than other ethnicities in the U.S.
Vergara is promoting McCartney’s limited-edition bra named Rose Romancing, which is available on their website. Sales of the lingerie set will benefit the Linda McCartney Centre in Liverpool, the Hello Beautiful Foundation in London, and Memorial Sloan Kettering in the U.S. The money will go toward early-detection programs and treatments for breast cancer patients. There’s nothing quite like that warm feeling you get after you receive a gift you’re really going to appreciate and love. Even better than that could be receiving a present that also helps a great cause. FlowerByPost, a flower delivery service joining forces with Breast Cancer Now. The Flower shop designed three beautiful new pink bouquets in aid of the charity. With every bouquet sold, £5 will be donated to help make life-saving research happen. 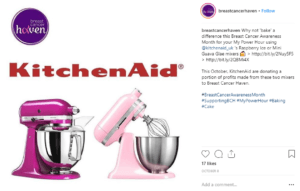 During Breast Cancer Awareness Month this October, for every KitchenAid Artisan Mixer sold £50 will be donated to Breast Cancer Haven. So, you can help a great cause, and also become the new Great British Baker as it’s impossible not to make delicious cakes for the office with this iconic mixer! A brilliant Christmas present to add to your list. 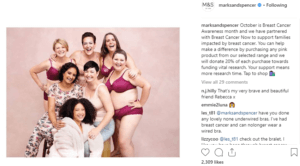 M&S is supporting the cause by donating 20% from its sales of selected pink lingerie and sleepwear. The website also features some inspirational stories of brave women who have faced the disease. The testimonials also include the stories of partners, friends, children and other family members– because the campaign not only recognises those diagnosed but also the amazing network of people who support patients. M&S’ website’s testimonials are powerful and makes their campaign very emotive. EasyJet are taking part this month by launching on-board collections to raise money for Breast Cancer now and Prostate Cancer UK. Cabin crew have been given an opportunity to don special charity branded uniforms, including ties, neck scarves, pink and blue epaulettes and pin badges, to further show their support for the cause. To find out how public relations can benefit your charity or gain exposure for your corporate responsibility initiatives please get in touch with a member of our team today. Whether it is strategy planning, CSR workshops or simply promoting your business we’d love to help.